Find the answers here for all your questions – from how to register for an online course, to a list of the courses you can take free if you have already graduated high school and are looking to take some grade 11 and 12 courses. A Student at a different online school? Registration details are on our Home Page. If I have already graduated high school, how much are the tuition fees? In addition, Adult Literacy Foundation courses (upgrading courses below Grade 11 level) are still tuition FREE for ALL students, including high school graduates. The Ministry of Education website lists these free courses. Note: Graduated students born AFTER July 1, 1999 do NOT have to pay the $375 tuition fee for any of these courses IF they register for an online course AND become ACTIVE in the course (by submitting a significant number of assignments or assessments) by April 26th, 2019. The tuition fee for international students is $1,175 per course. International students already enrolled at New Westminster Secondary School also pay the tuition fee of $1,175 per course. May I register for a course at any time during the school year? When we are open – YES. Most online courses are accessible throughout the year (except August). Courses are not accessible and our locations are closed in August to allow for staff holidays. Depending on staffing, a few of our courses might not be available between mid-June and September. Visit our Course Outlines page starting in February for details. How long does it usually take to complete a course? Our courses follow BC Ministry of Education curriculum and learning outcomes and are designed to be completed in about 120 hours of study for well-prepared students. For example, if you work on your course 10 hours a week, it would take you 12 weeks to complete it. Well prepared students have completed courses is as little as 100 hours or even quicker especially if they have taken the course before. Please contact the teacher of the course for more details. How do I write tests for my online course? How can I complete high school if I have not completed any courses in grades 10, 11 or 12? You will be asked to write an assessment and staff will go over your previous learning and work experience and will recommend a path towards graduation which may include taking upgrading courses before starting grade 11 and 12 courses. (Note: the GED is no longer available for students in BC). I don’t live in New Westminster. Can I still take courses there? Yes. Students who reside in BC can take our online courses. Students living outside the lower mainland or who for some other reason cannot physically attend can also take our online courses. To inquire about registering and about setting up remote proctoring for tests, contact us using our direct email form. We would be happy to answer your questions. Is there wireless access available in the Columbia Square Education Centre and in Room 187 (at NWSS)? Is the Columbia Square Education Centre wheelchair accessible? Yes, there is an elevator to get to second floor. We also have wheelchair accessible washrooms. Do I have to write the Provincial Exams? If you are completing the 80-credit Dogwood, you MUST write the following provincial exams: Communications 12 and English 12 (or the new English Literacy Assessment once it is available) and the Mathematics Skills Assessment (once it is available). If you are completing the 20-credit Adult Dogwood, the Provincial Exams are optional. If you plan on attending a post-secondary institution, we recommend that you write the English 12 Provincial Exam or the new English Literacy Assessment (once it is available). What’s the difference between the Adult Dogwood and the Regular 80 Credit Dogwood? All post-secondary institutions (colleges and universities) in B.C. accept both the Adult Dogwood and 80-Credit Dogwood as completion of Grade 12 graduation in British Columbia. The Adult Dogwood requires the completion of FIVE 4-credit courses, while the 80-Credit Dogwood is usually completed by students under 19 years of age and requires completion of at least 20 courses (which is 80 credits). program. A teacher will assist you with course choices at the time you register with us. 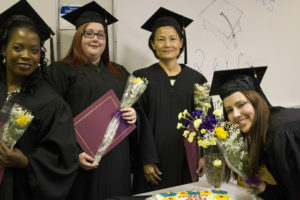 (Note: the GED is no longer available for students in BC). How do I get my Personal Education Number (PEN)? The PEN (Personal Education Number) is a 9 digit number that can be found on a student’s transcript or maybe found on a report card. If a student has attended high school in BC, our staff maybe able to retrieve a student’s PEN from the Ministry of Education. I want to complete some courses in BC but I will be moving to another province. Will I be able to transfer my credits? Yes, we will provide a transcript on request. I attended a school in another province in Canada. Can I get credit for those courses? Yes, you can get credit for courses taken at the secondary level elsewhere in Canada as long as the courses are similar to those offered by the BC Ministry of Education. To find out if your courses qualify, you will need to provide a copy of your transcript and then talk to a teacher. Do you provide textbooks and printed material or does the web content include everything I need to complete the course? While some courses require a textbook that students pick up on deposit, others have all the necessary material within the online course. If a textbook is necessary for the course, a $100 refundable deposit will be required (the $100 deposit will be refunded if the book is returned within one calendar year AND in the same condition). Some courses require workbooks. The cost for the workbooks is between $10 and $30 depending on the course, and is non-refundable. How can I pay for the deposit on materials or course fees? We accept cash, Visa, MasterCard and debit cards. You must pay in person. We do NOT accept personal cheques or other credit cards (i.e. American Express). Can I write more than one test per day? Yes, most courses allow students to write more than one test in one day if the student has adequately studied for the test. However, please note that most courses do not allow students to re-write tests. Please contact the teacher of your course for more information. How do I get help with my course? If you have questions about course material, or require individual instruction, please email your online teacher. Our teachers may be able to help students by email, by phone, by video link, or by meeting face-to-face with students. How does a student WITHDRAW from their course? If you have started a course and now do not want to complete it, email your teacher and ask to be withdrawn from the course. What percent do I need to get an A grade? A = 4, B = 3, C+ = 2.5, C = 2, and C- = 1. What score is a passing mark in our courses? A passing grade is 50% but students should aim for at least 70% for mastery of the material. Are there computers that I can use at the Columbia Square Education Centre? We have 10 PC computers that our registered students can use to access their course(s), and write tests. All computers have access to a printer. Students may only print materials related to their courses. Please check with staff before printing. My course is no longer listed in Blackboard? You may have been made inactive because you have not logged in recently. Contact your online teacher. I cannot view images or equations in practice tests? Change your browser’s settings to allow pop-up windows. Make sure that your Java is up-to-date. Make sure the browser you are using is compatible with Blackboard Learn, our course platform. See our Tech Help page for additional info. How do I submit assignments for my online course? You should complete your assignments using a word processor, such as Microsoft Word (make sure to save your file as a DOCX or RTF file), or you can type your answers directly into the assignment submission box. After completing and saving your assignment as a document, follow the instructions provided in the course for attaching the document. If you use Pages on a Mac or iOS device, first export your document as a Word document, then submit it. Is my computer good enough for an online course? For Windows: A Pentium 4 with a 1 GHz or better and Windows XP or better. ADSL or Cable connection is required. For Macintosh: You should have an iMac, iBook, MacBook, MacBook Pro with 1 GHz or better and OS X 10.5.or better. You must have an ADSL or Cable connection. We recommend that you use the latest version of Safari, Chrome or Firefox. Make sure that Java is up to date and ensure Pop-up blockers are turned off. Perform a check to make sure Blackboard Learn (our course platform) is supported by your browser and operating system. If you are still having difficulty setting up your computer, please contact your teacher. I am taking an online course with another School District, College or University. Can I arrange for the staff at your school to proctor my tests? If you are taking a course through an online program that is registered with LearnNowBC then the proctoring will be FREE. If your school is NOT a member of LearnNowBC, then the cost is $50 per hour for proctoring. Please email Jim Kemp for more information.